The PROCERA® AllCeram system is a variety of extremely dense-sintered aluminum oxide cores ideal for crowns, laminates, bridges and implant abutments. The strength in the core material is such that AllCeram can be used for prosthetic reconstruction anywhere in the mouth. Procera® AllCeram is 99.5 percent pure aluminum oxide and is biocompatible. 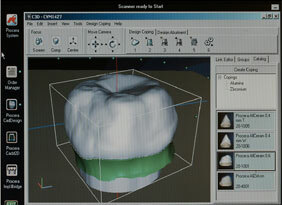 AllCeram provides the translucent beauty of an all-ceramic tooth yet prepares and cements like an ordinary crown. It’s as close to the real thing as you can get. Long-term clinical studies over ten years have shown Procera to be durable and consistent with unlimited potential. 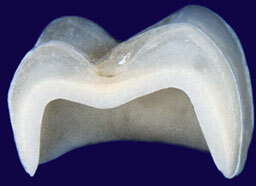 More than 1,700,000 Procera All-Ceram restorations have been placed in the patients mouths over the past ten years. Remarkable results have been obtained in controlled clinical studies. Extremely low fracture rates have been reported and the restorations serve for many years. More and more patients are asking for restorations made of material not containing metal or other alloys. Procera® AllCeram is made of a bio-compatible material (comparable to Titanium) which minimized the risk of allergic reactions.